The perfect bluewater performance cruiser for trouble free travels with years free of any major maintainance. The highest quality build aluminium yacht with excellent sailing properties and high resale value. This is your chance to purchase a sturdy and robust fast cruiser well below the replacement cost! This is a very desirable bluewater sailing yacht of great strength while relative light and with remarkable sea-kindness and sailing performance. 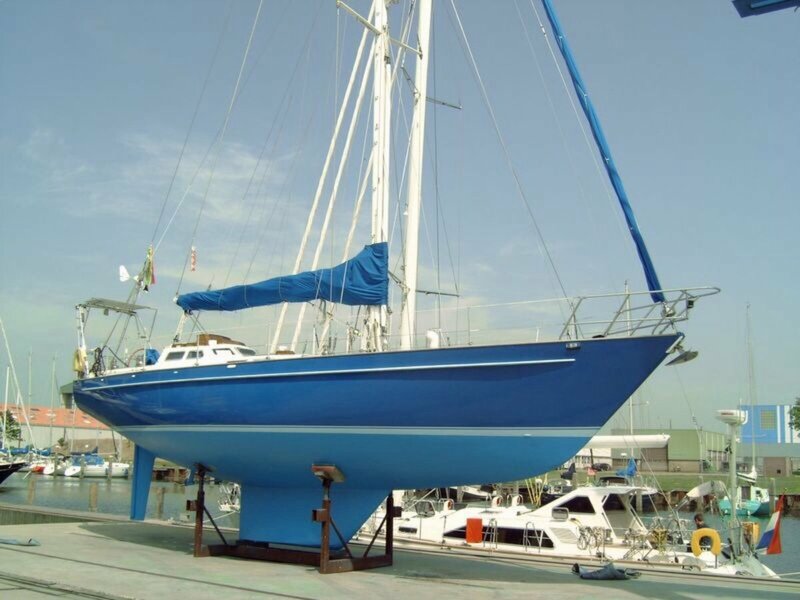 Once you have sailed her we are sure that this boat will live up to your expectations in every way. Her owner has kept the yacht in a really good condition, with many upgrades during the years, upgrades like a new engine, rigging, sails, ... The owned had 10 years of trouble free (single handed) sailing while many others got caught out by boat issues. The current owner bought her in 2007 and has made even more improvements to make her a reliable and safe bluewater cruiser; redundant (automatic) steering and redundant navigation equipment and lots of spares. This aluminium vessel have a high resale value thanks to the long life and high durability of the material and the quality of the inventory - making overall cost of ownership low. She is sure ready for her next adventure. Habbeké Shipyard, established in 1966, has more than fifty years experience of quality shipbuilding. The wharf builds exclusively in aluminium, and enjoys an excellent reputation for innovation, quality and service. These characteristics were recognised and honoured when Habbeké was awarded the Dutch Aluminium Prize. Highly trained workers, all of whom have years of education and experience in the Dutch Metal Industry, staff the company; in fact most of the staff have been with the company for 40 or more years. Aluminium is without question the most well reputed material for the construction of robust yacht. The yacht will be lighter and stronger than if it where built from fiberglass. Marine grade aluminium has such high impact resistance, that this vessel can withstand a collision that would seriously damage other (fiberglass) vessels. Marine grade aluminium also has excellent corrosion resistance, in most cases aluminium boats will last up to 50 years in the harsh saltwater environment. Aluminium is by far the lowest maintenance material that could be used for boat manufacturing. Residual values for aluminium boats are high. Bimini, Boom cover, Winch covers, Fuel Jerry can covers, Gas bottle cover. 2 x stainless steel sinks. Watermaker 80 lt/hr. Pump, CAT Stainless Steel Plunger Pump 3CP1221,. Driven by the engine. Inverter, Studer Innotec, AJ1000-24, Sinewave inverter. Modem Pactor-III, SCS PTC for HF email. Asymmetrie Spinnaker (100m2), storm sail. Proctor Mast with 2 spreaders and steps. Andersen two speed winches, ST56 (2x), ST46(4x), ST12(1x), and Meissner18 on the mast. Both hydraulic Steering System and Whitlock Mechanical Steering System. Internal and cockpit wheel steering. Tiller Pilot, Raymarine, ST1000Plus on the Aries windvane.